Photoshop Elements offers two workspaces — the Organizer and the Photo Editor — and you can toggle between the two. Here is the Photo Editor interface showing the new Filters button in Photoshop Elements 15 at the bottom of the Panel Bin. Click the button to open the Filters inside the Panel Bin. Open an image in the Photo Editor by choosing File→Open. Get information about your image by looking at the status bar. Click the right-pointing arrow to get more details about your image. Need to see detail in your image? Zoom into your image by pressing Ctrl+spacebar and clicking where you want to see the image close-up. Zoom back out by pressing Alt+spacebar and clicking. Easily switch the display for Tool Options to Photo Bin by clicking the Photo Bin button. 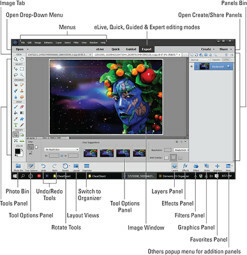 The Tool Options panel disappears and thumbnail images for photos opened in the Photo Editor appear in the Photo Bin. Access panels as needed by choosing them from the Window menu or the Panel Bin. Easily select tool options for a tool selected in the Tools panel by making choices in the Tool Options panel.